The Verkhovna Rada of Ukraine has not supported at second reading a law that suggests electing the parliament speaker by open vote. Only 217 out of the 352 MPs registered in the session hall voted for the bill on the amendments to the parliament's regulations on Tuesday. Verkhovna Rada Chairman Volodymyr Lytvyn proposed that lawmakers hold consultations on this bill, an Interfax-Ukraine correspondent reported. The bill also proposed a mechanism for the formation of a parliamentary group to prepare for the first plenary session of the newly elected parliament. 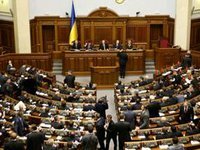 According to the bill, a candidate is approved as parliamentary speaker through an open roll-call vote (by electronic voting cards) by the majority of the constitutional composition of the Verkhovna Rada (226 votes). Under the current procedure, the speaker is elected and dismissed by secret ballot by at least 226 votes, provided that at least 300 lawmakers take part in the vote.